If you are a partner in your own small practice, you undoubtedly stay busy; but you probably wouldn’t have it any other way. The independence that comes from owning your own practice is a great reward for all the hard work. But you face specific challenges as well. One such challenge is the risk of financial loss if a practice partner passes away. Consider the following: What would happen to your business (and therefore your financial security) if one of your partners or investors suddenly died? Would their heirs now be your business partner? If your practice partner is a physician and he or she dies, is there cash available to cover their share of the overhead expenses while you find a replacement? Do you have cash on hand to buy out your partner’s or investor’s heirs? Though most people think of life insurance as a way to protect their families if they pass away, it can play a vital role in protecting you as a practice owner in a partnership if a partner should pass away. Purchasing a policy now can help you avoid the financial and emotional toll that the above scenarios would bring. Cross Purchase Plan: This plan may be the most practical for smaller practices with two or three partners. Each partner would purchase life insurance covering the other partners, and naming him or herself as the beneficiary. If one of the practice partners should die, the surviving partners use the life insurance benefit to fund the buyout of the late partner’s share of the practice. Entity Redemption Plan: If your practice has more than a few partners, this plan may be the most practical. The medical practice itself would obtain life insurance on the partners and would place itself as the beneficiary of the policy. If any partner dies, the practice would then use the life insurance benefit to purchase the deceased partner’s share of the practice from his or her heirs. Planning for the secure future of your medical practice requires professional advice. However you decide to protect your practice, it is important to speak with your tax professional so you understand the tax implications that are associated with each of these plans. 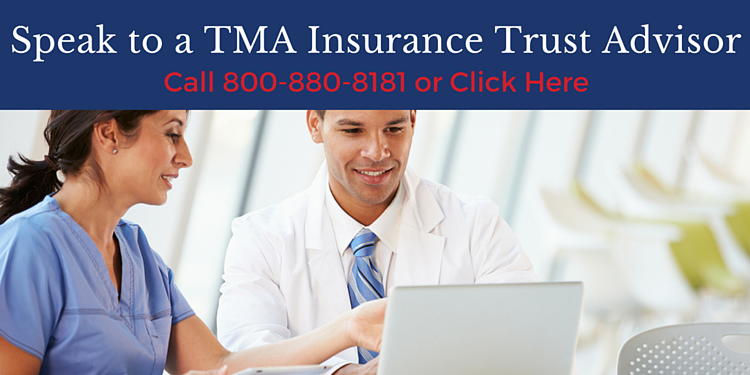 For questions about your insurance needs, an experienced TMA Insurance Trust advisor can help you. Our advisors work solely for Texas physicians and can provide knowledgeable guidance so you can secure the life insurance appropriate for your situation. Call us today for trustworthy advice. Is Your Life Insurance Due For An Update? Are There Holes In Your Life Insurance Safety Net?